For over two decades, our career fair has provided an opportunity for companies to network with highly-skilled, workforce ready Purdue computing students. Last year 78 companies and over 1,400 students joined us at our 2018 Computing Career Fair! The annual Computing Career Fair helps accomplish our club's mission of "Fostering the development of our members into computing professionals." Feel free to explore the rest of our website to see who we are and what we do! 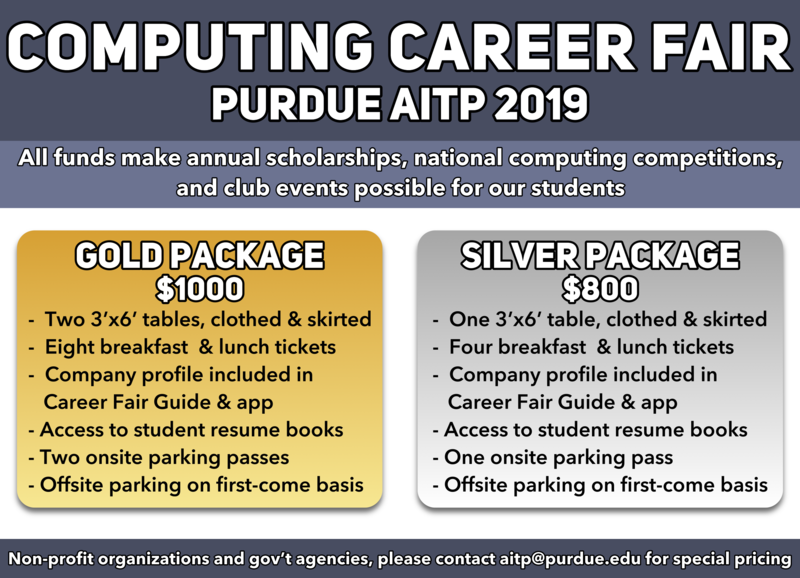 If you have any questions, please email Alijiah J. Bullard, Computing Career Fair Executive Director, aitp@purdue.edu. Get a preview of Purdue's highly-skilled computing students by joining us the night before the fair! This business casual event helps students and companies forge connections in a more informal setting as light food and beverages will be served. We highly recommend that our company partners take advantage of this free, non-resume event. EVERY computing major, including Information Technology, Computer Science, Computer Engineering, Cyber Security, Data Science, UX Design, Systems Analysis, and Network Engineering Technology, is represented at our career fair. Your company will surely find the exact type of candidate(s) you are seeking due to our diversity of majors! Room assignments will be given on the morning of CCF. Please indicate how many schedules your company needs on the registration form. Hospitality will be provided in the recruiters lounge throughout the day. In order to secure the early registration prices shown above, companies must submit payment by August 22nd. Late registration fees are $200 in addition to early registration prices. Interviews will be held on Friday, September 6th in the 2nd floor of Young Hall. If previously reserved, interview room assignments will be provided on the morning of CCF. The Feature Gym will be partitioned off as a company only area during the CCF. Breakfast and lunch will be served here along with bottled water, coffee, and other refreshments. This area may also be used to take phone calls and de-stress. Breakfast and Lunch are both catered as buffet style. Vegetarian options will be available. We fully understand that recruiting at a career fair can be a long day; therefore, we make sure our company partners are very well-taken care of! If you need anything during the fair, please don't hesitate to ask one of our Purdue AITP Executive Board Members. They will be wearing blue host ribbons. If your company requires electricity at the fair, please indicate this on the registration form.